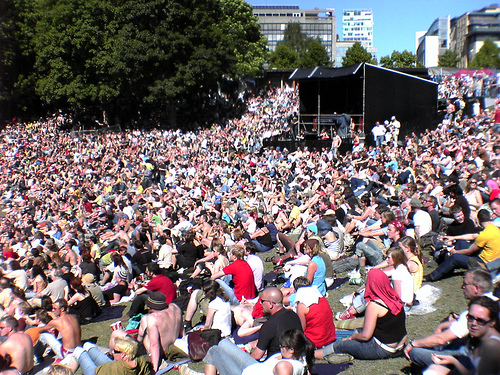 Norwegian Wood is an annual music festival held in Frognerbadet park area in Oslo. The name of the festival refers to the famous Beatles song ‘Norwegian Wood (This Bird Has Flown)’. The festival was established in 1992 by Jørgen Roll, Sten Fredriksen and Haakon Hartvedt and is one of the biggest music festivals in Norway. Frognerbadet contains of two swimming pools and park area close to Frognerparken and the Vigeland Sculpture Park, which is a very popular tourist destination throughout the summer. Norwegian Wood is known for presenting world-class artists and bands. Since 1992, big names like David Bowie, Johnny Cash, Emmylou Harris, CSN (Crosby, Stills & Nash), Patti Smith, Audioslave and the Foo Fighters have played for thousands of music lovers. It was here that David Bowie in 2004 got a lollipop in his eye during his concert. He took the episode with humor and played a cover song as punishment. This is a festival for ‘mature’ music fans which the artist line-up shows. Many of the bands and artists bring back memories from childhood and adolescence. Children enter for free when accompanied by adults so many choose to bring the whole family to the festival. The doors close before midnight so you’ll have a good night sleep at home, and not have to worry about locating your tent in the dark. This year the festival runs between 14th and 18th of June, with big artist names like Bryan Ferry, Tom Petty and the Heartbreakers, Sting and Lenny Kravitz. Norwegian Underwood is a newer concept that allows unknown bands to play at the festival. Several Norwegian bands have started their careers here like Kaizers Orchestra and Johndoe. Click here for complete list of past performers and information about the festival.